Mary Bickerdyke was known as "Mother" Bickerdyke, due to her nursing of soldiers during the Civil War. Mary Ann (Ball) Bickerdyke was a nurse and health care provider to the Union Army during the American Civil War. Bickerdyke was born on July 19, 1817, near Mount Vernon, Ohio. She enrolled at Oberlin College, one of the few institutions of higher education open to women at this time in the United States, but she did not graduate. Upon leaving Oberlin, Bickerdyke became a nurse. She assisted doctors in Cincinnati, Ohio, during the cholera epidemic of 1837. Ten years later, she married Robert Bickerdyke. The couple moved to Galesburg, Illinois in 1856. Robert Bickerdyke died two years later. Mary Bickerdyke continued to work as a nurse to support her two young sons. At the outbreak of the American Civil War, residents of Galesburg purchased medical supplies worth five hundred dollars for soldiers serving at Cairo, Illinois. The townspeople trusted Bickerdyke to deliver these supplies. Upon arriving in Cairo, Bickerdyke used the supplies to establish a hospital for the Union soldiers. Bickerdyke spent the remainder of the war traveling with various Union armies, establishing more than three hundred field hospitals to assist sick and wounded soldiers. During battles, Bickerdyke commonly risked her own life by searching for wounded soldiers. Once darkness fell, she would carry a lantern into the disputed area between the two competing armies and retrieve wounded soldiers. She was present at the Battle of Shiloh, the Atlanta Campaign, and many other engagements. Both Generals Ulysses S. Grant and William T. Sherman admired Bickerdyke for her bravery and for her deep concern for the soldiers. She also earned a reputation for denouncing officers who failed to provide for their men. To assist the soldiers, Bickerdyke gave numerous speeches across the Union, describing the difficult conditions that soldiers experienced. She also solicited contributions from the civilian population. The soldiers nicknamed Bickerdyke "Mother Bickerdyke" because of her continuing concern for them. General Sherman asked Bickerdyke to participate in the grand review in the nation's capital following the Civil War. She led an entire corps down Pennsylvania Avenue. Sherman offered Bickerdyke a seat on the reviewing stand as the parade passed by, but Bickerdyke refused. She preferred to pass out water to the soldiers after the parade. With the Civil War's conclusion, Bickerdyke continued to assist Union veterans. She provided legal assistance to veterans seeking pensions from the federal government. She also helped secure pensions for more than three hundred women nurses. Bickerdyke herself did not receive a pension until the 1880s. It was only twenty-five dollars per month. 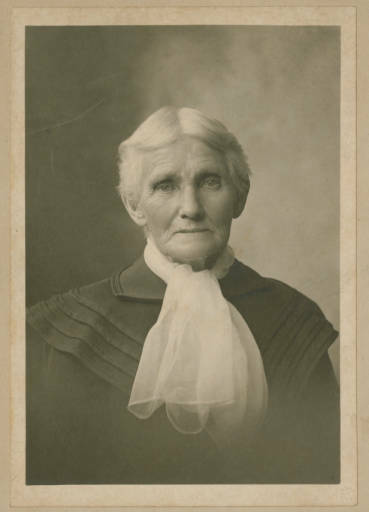 Bickerdyke moved to Kansas following the war, where she helped veterans to settle and begin new lives. She secured a ten thousand dollar donation from Jonathan Burr, a banker, to help the veterans obtain land, tools, and supplies. She also convinced the Chicago, Burlington, & Quincy Railroad to provide free transportation for veterans hoping to settle in Kansas. Due to Bickerdyke's efforts, General Sherman authorized the settlers to use government wagons and teams to transport the belongings of the veterans to their new homes. Bickerdyke remained in Kansas for most of the rest of her life. She settled in Salina, Kansas, where she opened a hotel. She continued to fight for the rights of veterans. She moved briefly to New York, before returning to Kansas with her two sons. Bickerdyke moved later to California, hoping that a change of climate would restore her declining health. She settled in San Francisco, where she accepted a position at the United States Mint. Bickerdyke eventually returned to Kansas, where she died on November 8, 1901. She was buried in Galesburg, Illinois. Baker, Nina Brown. Cyclone in Calico: The Story of Mary Ann Bickerdyke. Boston, MA: Little, Brown, 1952. Schultz, Jane. Women at the Front: Hospital Workers in Civil War America. Chapel Hill: The University of North Carolina Press, 2007. De Leeuw, AdÃ¨le. Civil War Nurse, Mary Ann Bickerdyke. New York, NY: J. Messner, 1973.